When business doers run an e-commerce enterprise, they often struggle in how to keep their stores safe from the risk of being attacked by hackers. Because the interference of hackers can significantly damage the ongoing development of a company, every store owner always wants to look for the best solution for this issue. That is the reason why our Security extension is developed to ensure safe performance for any Magento online stores. With numerous highlighted features, this extension is sure to please any shop owners. Especially, with the appearance of Admin Action Log makes management process much easier when all login attempts are recorded and under control of shop owners. 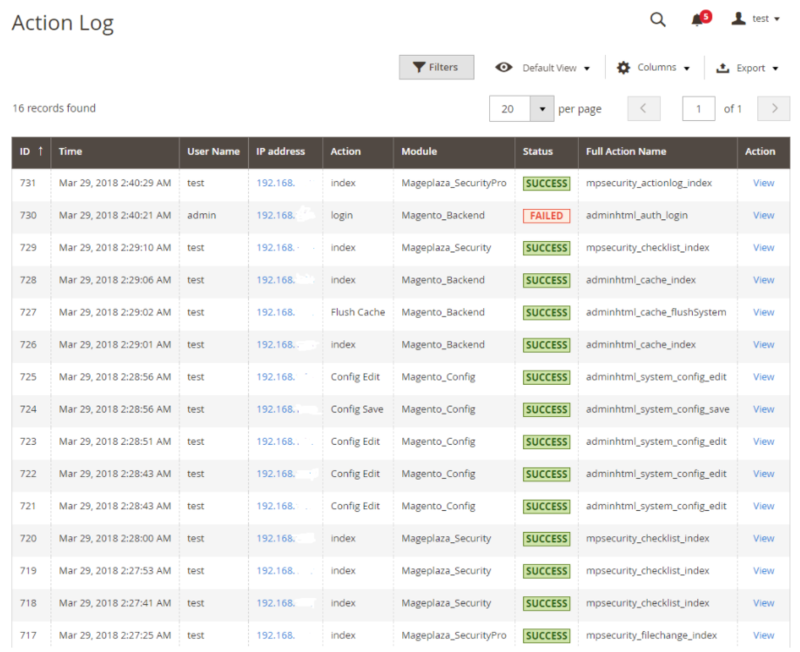 Whenever shop admins want to take a look at all login activities within their stores, from the Admin Panel in the backend, they can go to Mageplaza > Security > Action Log. After that, on the result page, a grid will be shown with detailed information about each login attempt. The grid comprises of several elements which are ID, Time, User Name, IP Address, Action, Module, Status, Full Action Name, and Action. When looking at the grid, shop owners can easily notify unusual login attempts to take suitable actions to protect their stores from hackers. Besides, in Action column, admins can click on View button to see more detailed information about a certain login attempt without being attracted by others. In case shop admins find some IP address unusual, they can click on that IP address, then they will be switched to TraceIP page to easily manage this IP address. By doing so, store owners can quickly identify dangerous login to prevent. Besides, all logs created in the grid can be automatically deleted if store admins configure to delete logs after they are saved. With Mageplaza Security extension, not only Login attempts are saved but also file changes are also recorded to keep track of all changes to every file instantly. Explore. Additionally, on the result page, store managers can make use of other functions to ease their management task. By using Filter, they can easily navigate a specific login attempt without having to look up from several logs in the grid. In case they want to simpler information in the grid, they can select Column to decide which columns to appear in the grid only by marking or unmarking actions. 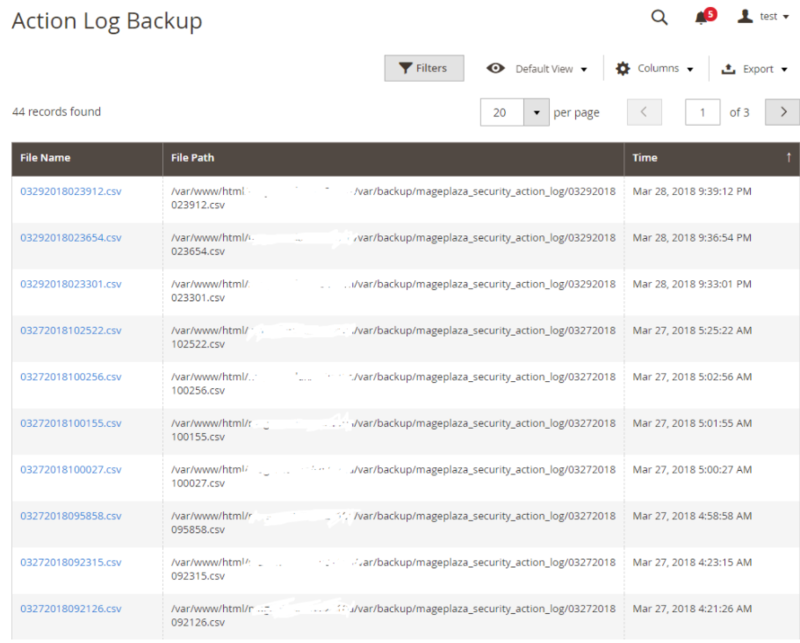 To use this function, store admins can access from Admin Panel > Mageplaza > Security > Action Log Backup. Then, they can see a grid of information including columns File Name, File Path, and Time. This function allows users to store all Login Log within their stores under csv files. Only by clicking on a file, they can download that file to their devices. Similar to Action Log, here store owners can take advantage of several features such as Filter or Column depending their intention.